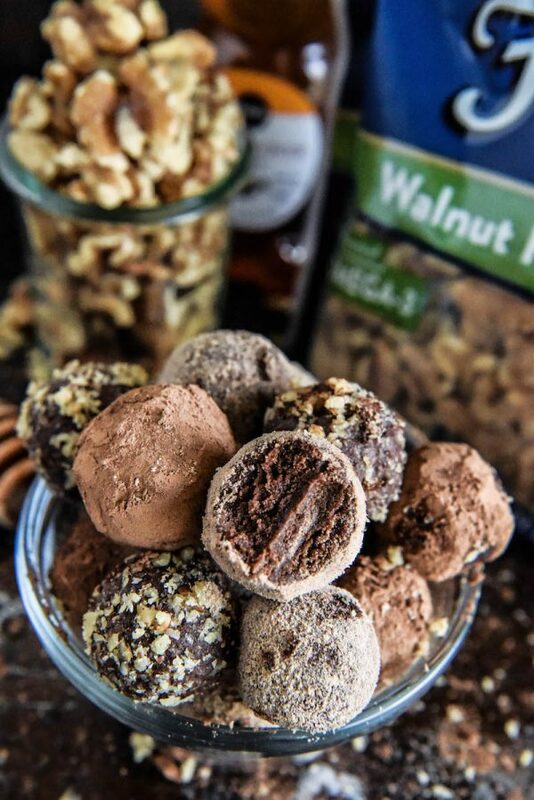 Healthy Chocolate Walnut Truffles: these four ingredient, heart healthy, truffles are filled with walnuts, protein powder and dates to keep you full longer! January seemed to drag on, I swear those 31 days felt like 31 months, but February has truly flown by. However, I am happy to say we are still holding true to our healthier lifestyle! February is the American Heart Month and we have continued to focus on being heart healthy. The key to our success has been planning ahead and keeping a fully stocked kitchen. It’s way too easy to make a bad food choice when in a time crunch, but always having healthy snacks and easy meals around helps keep us on track. One item we always have on hand — Fisher Nuts. Fisher has nine varieties that are verified as heart healthy by the American Heart Association. We use them all the time in salads, energy balls, grain free trail mix and salad dressings. They are also wonderful crushed up and breaded on chicken, fish or pork for a healthy and filling dinner. And best yet, I love them plain out of the bag for a snack. The one of a kind stand-up bag keeps the nuts fresh — perfect for grabbing a handful whenever you’re hungry! 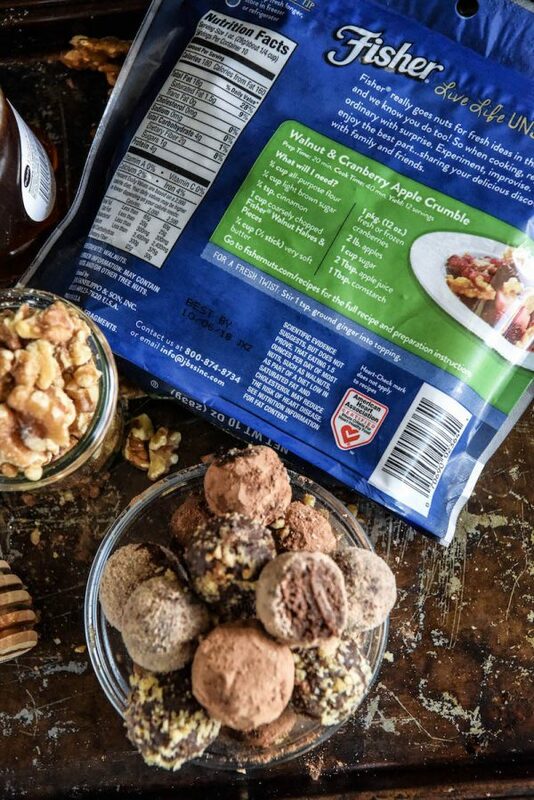 One great recipe we have been making a lot lately are these Healthy Chocolate Walnut Truffles. They make the perfect on the go snack or a sweet ending to a packed lunch. 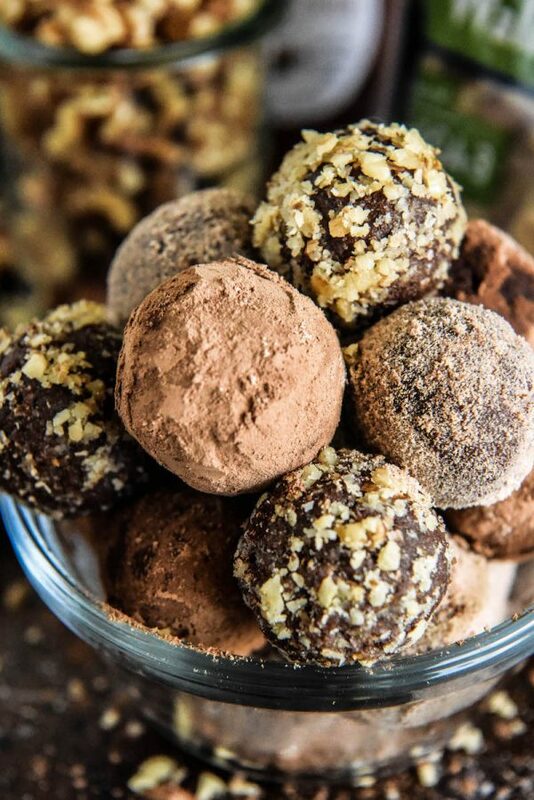 These healthy truffles are no-bake, only require four ingredients and take 15 minutes to make. Bonus: if you can get the kids to help roll them into balls, they take half that time! There are a few reasons my family chooses Fisher. 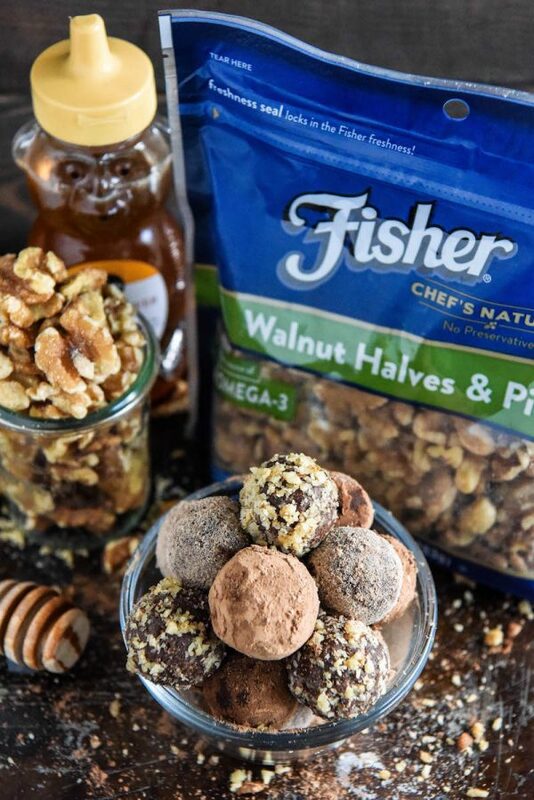 First and foremost, Fisher nuts are non-GMO Project Verified and contain no preservatives. They do not add salt or any additives to their nuts. And as I mentioned earlier, they have nine varieties of Fisher nuts that are verified by the American Heart Association as heart healthy! 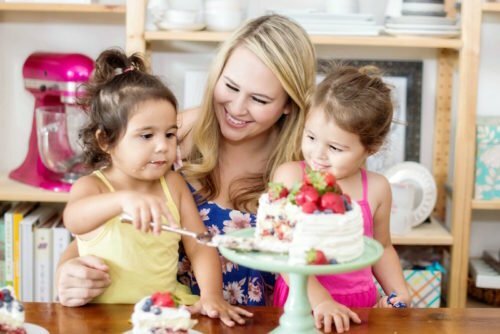 It makes it easy to grab them off the shelf knowing they are good for my family. Fisher nuts are available on Amazon at www.amazon.com/fishernut and for more great recipe inspiration, check-out FisherNuts.com. 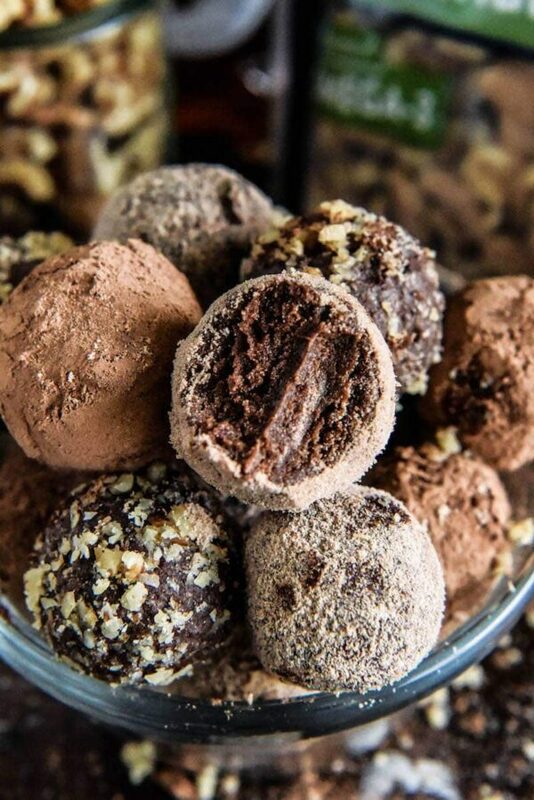 These Healthy Chocolate Walnut Truffles can easily be changed to suit your family’s tastes. If you aren’t a fan of chocolate, I recommend using a vanilla protein powder and pecans. They taste like a healthy pecan pie truffle! Another fun flavor idea includes vanilla protein powder, almonds and a few good shakes of cinnamon to make healthy snickerdoodle truffles! Yum! 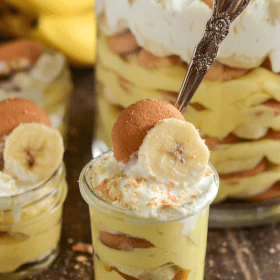 I am sure you will be making these healthy energy bites all the time once you see how easy they are to make. 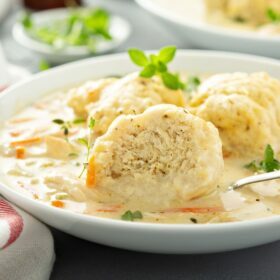 You really only need a few minutes to toss everything together in a food processor, squeeze out any excess oil and then roll the dough into balls. 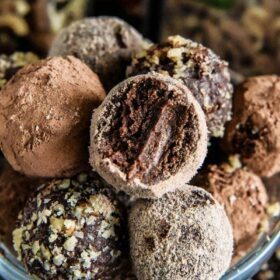 I hope you enjoy these Healthy Chocolate Walnut Truffles and I look forward to hearing about all the flavor combos all of you come up with! In a food processor, puree Fisher walnuts, dates, protein powder until a smooth dough forms. Add honey and puree until well combined. Using cheesecloth (a thin tea towel or strong paper towel also work well) squeeze any excess oil from the dough. There shouldn’t be much, but there will be a little that needs removing for the toppings to stick. Roll one heaping tablespoon of dough into a ball. Optional: roll balls in the suggested toppings. Repeat with remaining dough. Store in an airtight container for up to 5 days. Can also store truffles in the refrigerator if you prefer them cold! Anything that involve chocolate I am so in! I love that you used the dates!! This is a perfect pick me up when you are trying to stay on track! Such a great (and healthy!) sweet treat to snack on. I love how easy! 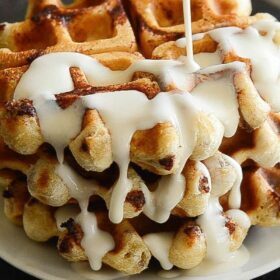 I love how easy these are to make! Such a great snack to stay on track! 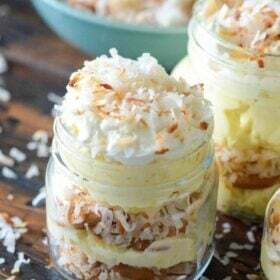 I am such a snacker and these would be great to satisfy a craving! I love all things chocolate!! I could not be trusted with these around! They look so delectable! These truffles looks so amazing! I am always on the lookout for a healthy dessert! Awesome TRUFFLES! I love these. 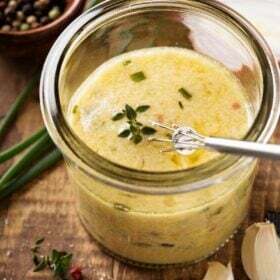 Thanks for sharing this recipe, was very easy to make and good. WOW! Made these and they were delicious. 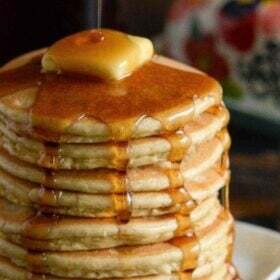 I used vanilla protein powder and added cocoa powder. This recipe saved my saturday.